I've gardened here for fourteen years, and paths have come and gone. 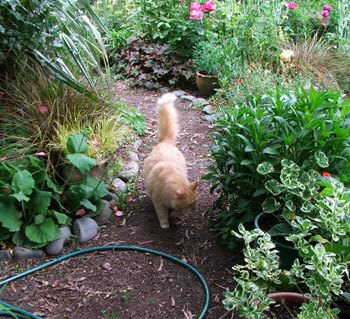 Finally the Moosey country garden has a properly organised network of great garden paths, consumer tested by the cats and the dog, down which it's a pleasure to be led! 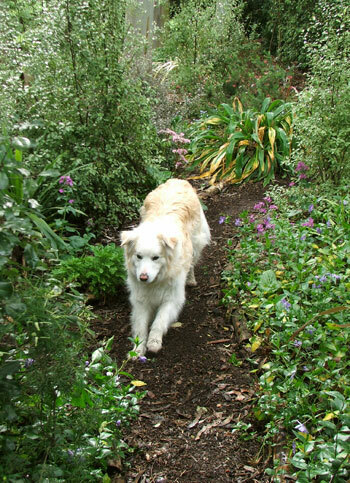 It's the winter of 2008, and I've spent the last month obsessed by my garden paths, thinking about their raison d'etre (my goodness, that sounds terribly serious). I've been staring into gardens, squinting and pointing and waving my arms. I've been deconstructing and reconstructing the old, and creating the new. And I've seen the light, pathwise, after many feeble attempts over the years. And it's all so simple. There's much more to a garden path than I ever thought. Firstly, the shape of a path creates shapes in the garden, and winter path-making clearly demonstrates this design concept. Rather than thinking merely of path-travel, the shape of the garden on each side must be seen, and enjoyed. The shapes of these areas will even make everything look better designed, and bring to previous random plantings a sense of form and, dare I say, style! My latest paths have better-shaped routes, too. In the past I've simply stuck with gentle curves moving between this lawn and that feature. But now I know better! Forked 'Y' shapes are magical, giving the path-follower that most delightful of experiences - choosing which way to go! In one garden I've used letters of the alphabet to create a network of paths. Shrubbery visitors will expect to see a few 'C's and 'S's - but as well they'll find several curly 'Y's, a grand sweeping 'J' and a slightly wriggly 'X'. Enjoy! Paths need a purpose, otherwise no-one will walk on them. Their destination is as important as the journey. In my garden there are many different lawns and borders which need sensible connections, from whichever direction the gardener (with wheelbarrow) or visitor approaches. Sometimes, when a path peters out or there's no obvious destination, I'll improvise. If a path comes to a grinding halt at a fence, I'll make sure it's by a post, and then order a stile to be built. Or I'll place a large pot, or a garden seat, at the path-end: Oh - so this is what the path's for! What a beautiful spot! Sits down, satisfied, on garden bench. 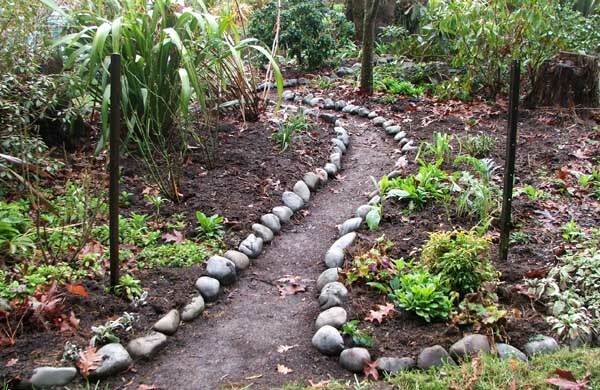 There are definite planting tricks to learn with paths. I often use edging clumps of Bergenias or Renga Renga, or plant a row of small Hebes equidistant from the edge. Special, one-off lovelies get placed in the natural curvy 'corners'. Flaxes and tussock grasses must keep their distance, lest they trip up any dreamy gardeners balancing wobbly wheelbarrows. Or visitors! My paths have always had the ability to relocate, be recurved, or be seriously rerouted. For edging I use free materials that I can easily collect - smooth river stones, or fattish logs (next winter's firewood). Then I level the ground and lay weed-suppressing newspaper, catching it underneath the edging. Thus I can keep a constant width, lay a pretty curve, and the newspaper won't blow madly away! A load of soft, fine bark mulch forms the final surface. This will compact down nicely with a bit of walking and wheeling and a few wet weather days. Stray leaves, for example, are then easily raked off. And what if the path is wrongly placed? Each element is simply moved over or out! 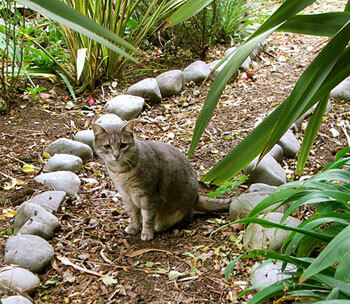 If nearby plants have the nerve to outgrow their place (oops) it's often easier to move the path, anyway!